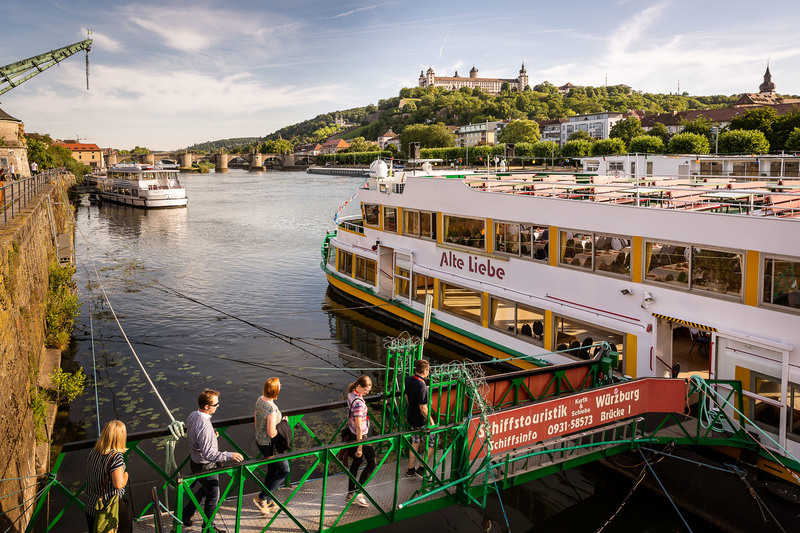 From 2 to 4 July 2018, the industry got together in Würzburg for the 12th Connectors User Congress. 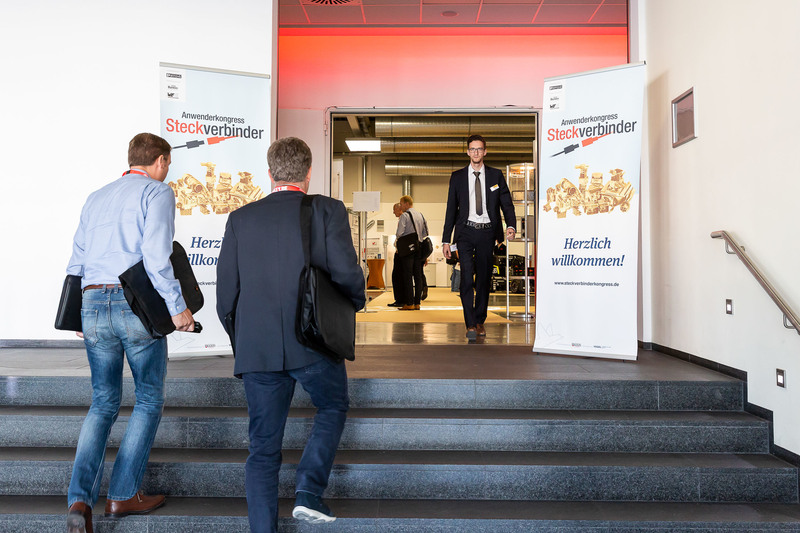 330 attendees and 42 exhibitors exchanged their experience and discussed current developments and best practice solutions. As always, there was plenty of room for networking and making contact in a pleasant atmosphere. Data is the new oil. A connected car generates 25 GB of data per hour. By 2020, 90% of all cars are expected to be connected. Today, connected machines generate 2.5 quintillion bytes of data every day. 80 million wearables will produce 2.314 exabytes of data in 2020. Extracting information from this data is the actual challenge. This is where augmented intelligence comes in – enhanced human intelligence. By using a combination of machine learning and deep learning, those learning systems interpret even unstructured data, for example, as generated in industrial environments. 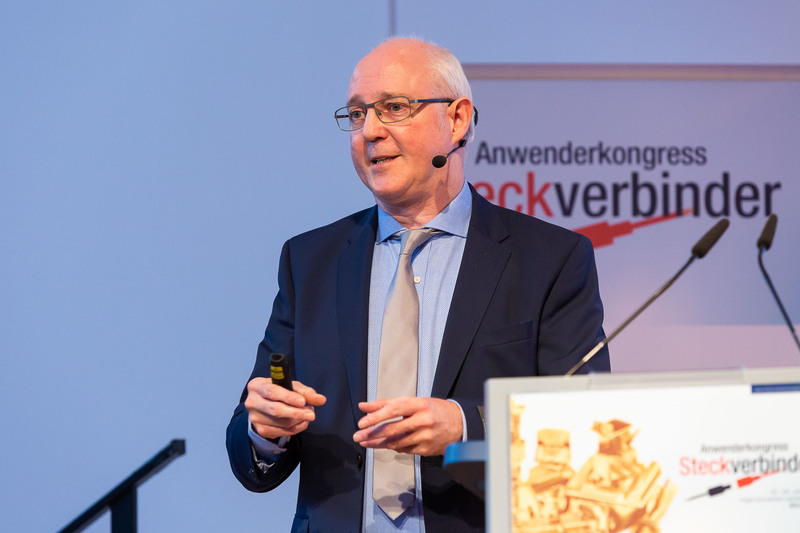 In his keynote “AI – The Era of Augmented Intelligence“, Ralf Bucksch (IBM) drew an arc from the digitalization of the industry to current developments in the field of Artificial Intelligence and the requirements on hardware and software. This entails a new understanding of signals (from video and text to human perception), new learning and thinking (from scalable machine learning to case studies) and new ways of interaction (Artificial Intelligence with an understanding of speech, sound, emotion and context). 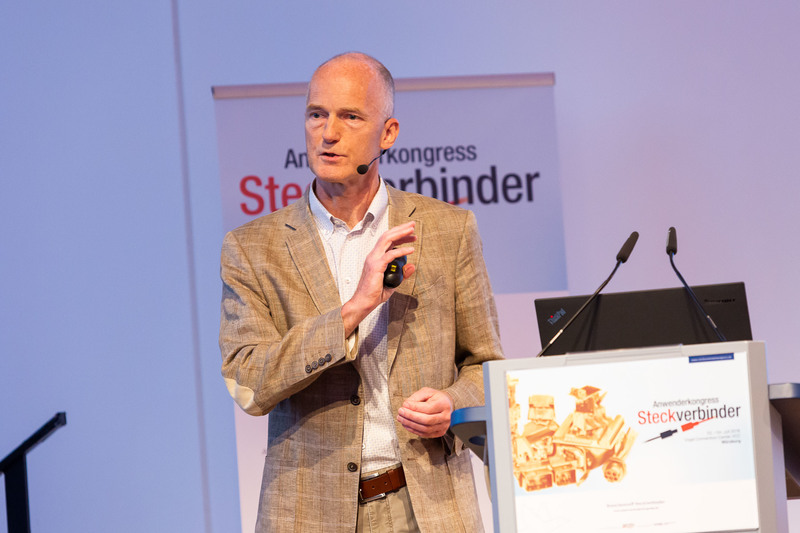 Additive manufacturing processes hold significant potential: shorter product creation phases, new solutions through new geometries and connector manufacturing based on individual specifications. The related materials, quality assurance and product design, however, continue to be a challenge. 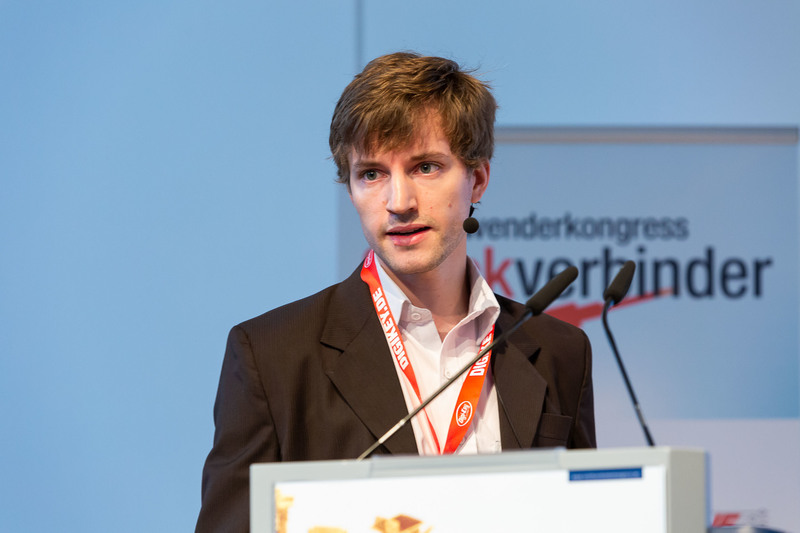 The presentation by Johannes Lohn (Protiq), titled “3D Printing Manufacturing Process for Connectors“, gave an overview of processes and printable materials. Processes range from fused deposition modeling of plastics (FDM), laser sintering of plastics and polymers (SLS), laser melting (metal), stereo-lithography (SLA) to vacuum casting and polyjet/multijet 3D printing. Suitable materials are PA6X and PP, highly conductive copper, zinc as an addition to zinc alloy die casting, brass and, in future, PBT, PPS, PEEK and flame-resistant PA6 as well as native copper and high-tensile tool steels (H13, H11). The concept of application neutral communication cabling (ISO/IEC 11801) came up in the early 1990s and is still relevant, even though data cables and wiring are much more complex today. The basic idea was to create a symmetrical twisted-pair copper cable (UTP or STP) for all services. RJ45 is the prevailing connector technology. 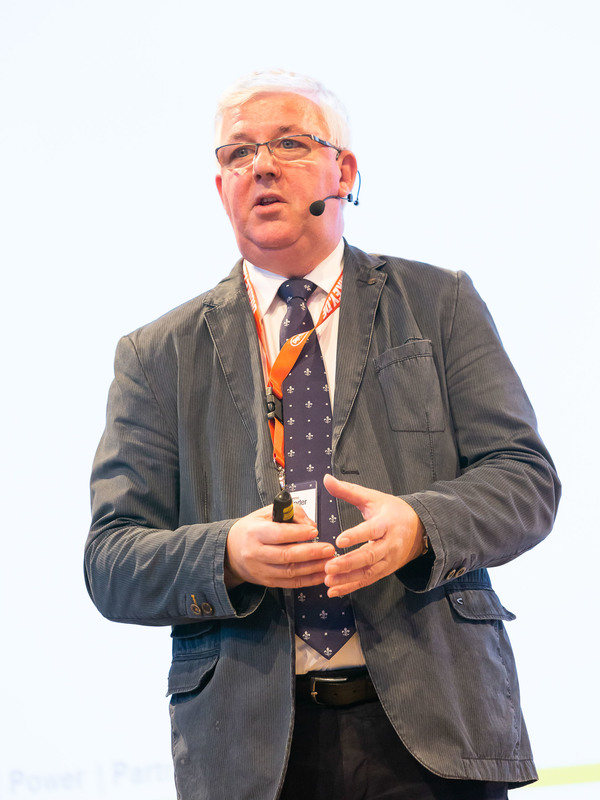 Rainer Schmidt (Harting) presented innovations that came along with ISO/IEC 11801 edition 3 published in November. He focused on future developments and their effects on connector technology. Connectors are defined for symmetrical and coax copper wiring as well as optical fiber wiring (not POF). In addition to RJ45, M12 designs (100 Ω), coax connectors (50 and 75 Ω), LC connectors (duplex/simplex) and MPO connectors (12/24 fibers) are defined. Symmetrical copper cables are easy to install and transfer supply voltage to devices - this is a major advantage over optical fiber cables. Moreover, SPE (single pair Ethernet) will have an impact on data cabling across all areas of application, including IIoT and automotive. 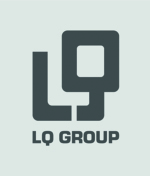 The new application will initially be implemented in the industrial and building automation area. Channel descriptions cover SPE from 10 MB to 1 GB. RJ45 is typically the default connector of choice for Industrial Ethernet. But is it also suitable for use in harsh industrial environments? 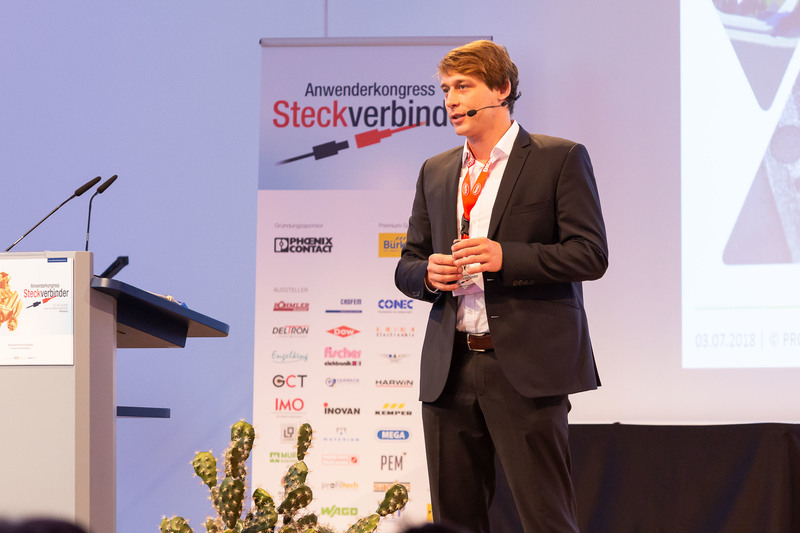 Peter Jaeger (TE Connectivity Netherlands) examined this issue by comparing the reliability of Ethernet connectivity systems in IP20 applications. Tests were performed on RJ45 and Mini I/O, pierce contact, solder contact and field installable versions, from five different manufacturers. Testing covered mechanical, vibration, durability, dielectric strength, interference resistance, normal force and resistance tests, with test combinations and severity exceeding IEC 60603-7-3. Mini I/O performed best on several key performance criteria for usage in industrial applications. Short discontinuities during vibration are low due to a stable mechanical interface and double spring/double contact point layout. There was a very stable flat resistance line during cable motion after environmental stress tests. The screening attenuation of the Mini I/O is better by a factor of 10 compared to all other connectors. 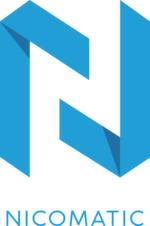 This connector design is moreover 25% smaller and has high stress relief (98 N). Therefore, it is perfectly suited for use as cable-board connection in harsh IP20 environments. Electric arcs caused by voltage surges are critical on DC connectors, other than on AC connectors. Efficient design measures can prevent the occurrence of electric arcs. Marc Klimpel (Phoenix Contact) presented results obtained in the scope of the consortium project “Protective Devices for DC”. Basically, there are several methods to implement protection: extending the arc length, confining the arc by design, cooling the arc through the casing, subjecting it to gas or magnetic blowout, changing the arc medium, increasing the air gap pressure or the separation speed. In practice, the companies involved focused on sacrificial areas for contact protection, spring force for reliable separation as well as electronics for spark quenching. Sacrificial areas made of specific materials serve to cool the electric arc by channeling it into narrow gaps; the electric arc remains within the casing. Springs can be used to increase the separation speed. In collaboration with Ingun, Phoenix Contact implemented the concept of using spring force to accelerate pins. This facilitates separation speeds of 3m/s, dispersing the electric arc in a very short time – an interesting approach particularly for building installation. 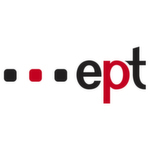 E-T-A developed a hybrid system that switches the load off electronically. To this end, power is temporarily channeled through an electronic system and switched off there before the load contacts cut the connection. The electronic system can be installed in the power socket or on the header. Standardization of Product Descriptions – Useful or not? 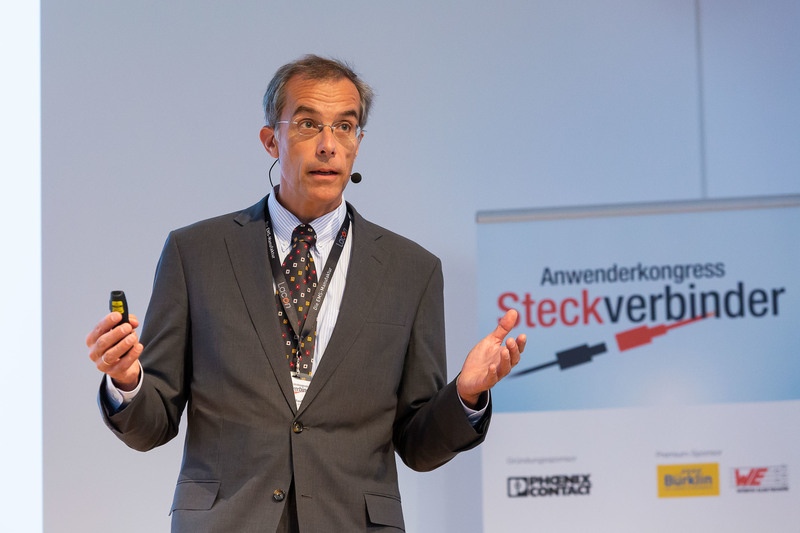 Last year’s congress ended with the request for “standardization of product descriptions”. But is it feasible, and would it meet today’s requirements? Kai Notté (Bürklin) addressed the issue from a distributor’s perspective. He analyzed and classified the search behavior of customers visiting their web shop. Most of the search requests could not be classified, because they contained misspellings or typos as well as specific search terms like “D-Sub 15-pin”. In many cases, search engines have different interpretations of the character “-“, as “minus ” or as control symbol. Consequently, a search either provides the desired result (minus) or no result (control symbol). Distributors are free to implement standardization and harmonization. Standardization can be achieved by means of suitable programs but only relate to in-house terminology, not to customer-specific search terms. As an alternative, harmonization can be achieved by translating product data and creating synonyms. This way, a database would deliver enhanced search results. According to Notté, this process could be related to as harmonization of product descriptions also comprising standardization. Customers often request connector qualification according to various UL standards. Connectors can also be tested according to the IEC 61948 standard. In his presentation, Dr. Bartlomiej Poltorak (UL Poland) provided details on tests and processes related to the IEC 61984 type examination certificate. He also presented the classifications, design and performance requirements, test methods and procedures employed in UL test labs. Testing covers mechanical properties (such as strength, bending load resp. distances, creep distance), temperature behavior, dielectric strength, resistance between metallic components and PE contacts as well as corrosion properties. Connectors that are not suitable for backplanes are tested as well. 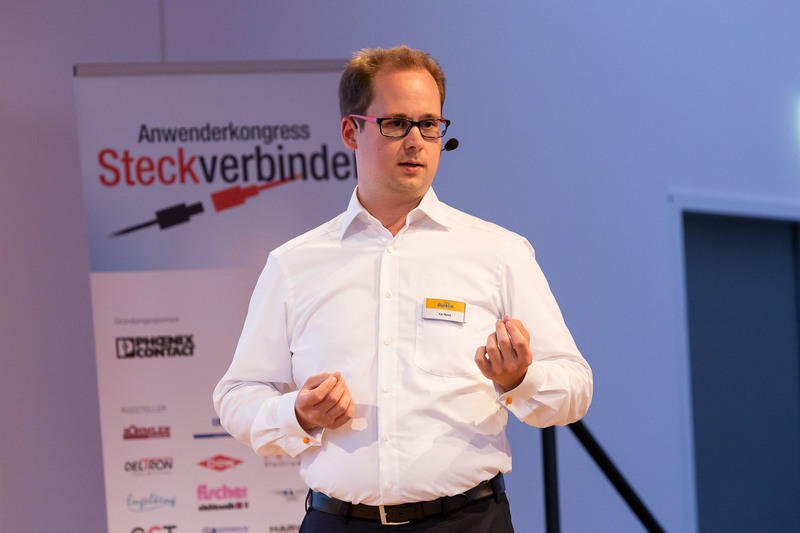 Robert Wuyts (Föhrenbach Application Tooling) dedicated his presentation “A Connector is Born” to the challenges related to the manufacturing, testing and assembly of connectors. Right at the beginning, he emphasized that there is no process that could manufacture all connector types. He classifies assembly processes into the assembly of single contact parts, series assembly, fixed or variable arrays, selective assembly or hybrid variants with several contact types. The assembled connectors are extensively tested and supplied in tubes, on palettes, on tape or in bulk. Manufacturing platforms range from single contact part assembly to series assembly and comprise semi-automatic machines with one or several placement heads as well as fully automatic assembly machines. The design of a connector can have an impact on the assembly complexity and the quality of a connector. The casing of an angular connector should be designed such that the contacts are bent only after insertion. Contacts should basically have distinct shoulders so that they can be easily inserted into the casing. 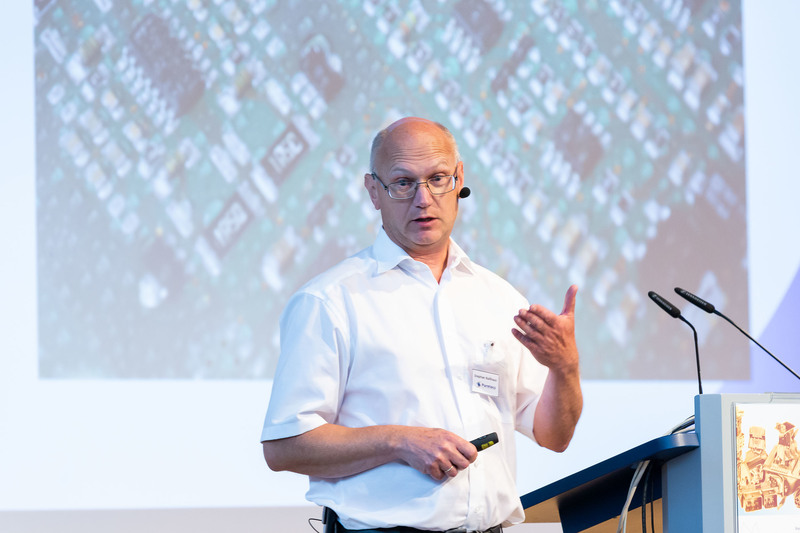 The last presentation of day 1 was given by Michael Kress (Iriso) who presented the first spring loaded 3-directional board-to-board connector that is particularly suited for automatic assembly processes. To accommodate the continuing trend of miniaturization and modularization, available space has to be utilized in full, to the entire height and width. However, stacking causes issues like tilting or excessive force when mating the connector. For this reason, conducts and centering aids as well as floating 1- or 2-directional connectors are used. The first variant is suitable to a limited extent and entails higher costs and effort; the second is not resistant against vibration and shock. In a three-directional spring system, the spring can move along three axes. This enhances shock and vibration resistance, virtually eliminates wear and offers constant long-term resistance and impedance levels. Applications include electric motors with possible load alternations and imbalance in operation as well as devices subject to high acceleration, e.g. robotic arms or linear control systems. The second day of the congress started with a focus on automotive. 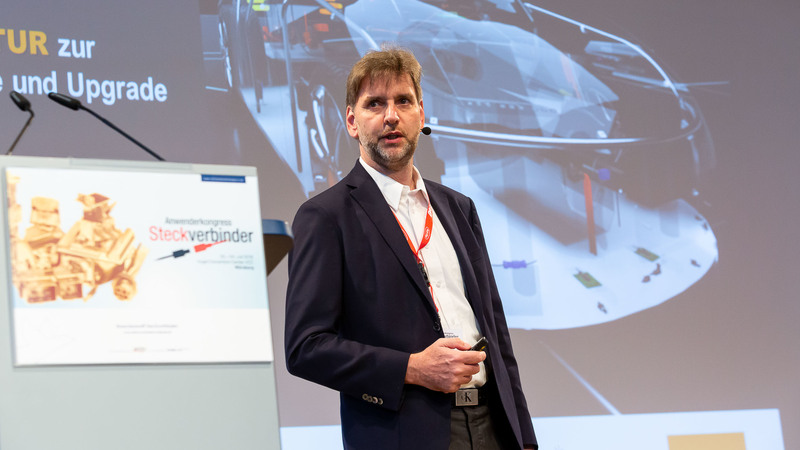 This year, Dr. Ralf Kakerow (TE Connectivity) elaborated on the challenges of autonomous driving and the related solutions: connectivity through special network infrastructures, smart designs and miniaturization, reliable components and processes as well as high-speed data transfer. Autonomous driving technology is powered by increasingly centralized functionality, a growing number of sensors and modules as well as miniaturization of components and interfaces. This calls for interference immunity optimization through scalable connector systems (enhanced EMC). With a scalable modular approach, high-performance UTP systems can be implemented, offering optimum symmetry and signal integrity as well as the selective use of STP for efficient interference suppression in critical links. Miniaturization facilitates quad shield coax connectors and the integration of active optical systems in connectors. Conclusion: On-board networks of the future require customized connectivity solutions for in-vehicle networks, infotainment and safety. Automotive solutions call for a holistic system approach that accommodates performance, reliability and process requirements. For sure, the amount of connectors will increase, signals will be bundled and new connector concepts with integrated security features will be required. However, it will probably take 10 or 15 years until such systems are available. Integrated electrical powertrains with the power electronics placed directly on or in the electrical traction machine offer advantages in terms of system power density, EMC and system costs (for example, no housing and AC cabling required). At the same time, integration results in increasing requirements on components and interfaces, particularly in terms of vibration and thermal impact. 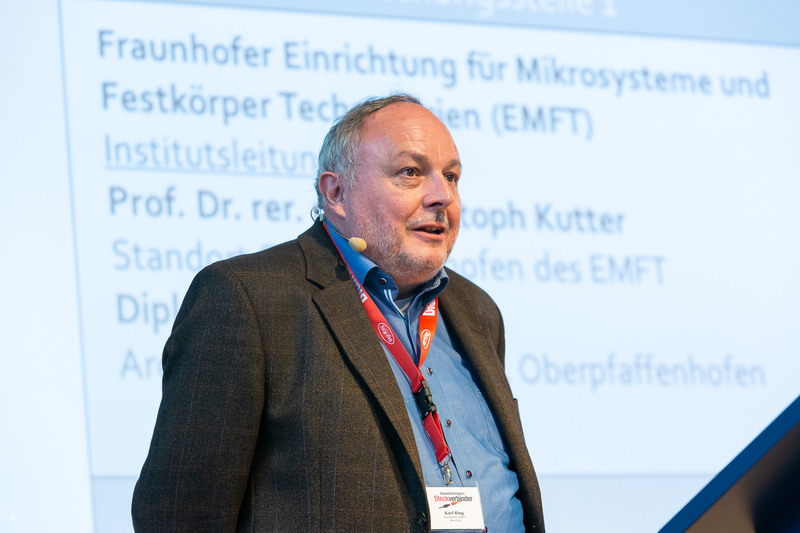 Thomas Schriefer of Fraunhofer IISB talked about the BMBF funded project KontACt-E. From 2017 to 2019, different contact technologies are examined to determine their suitability as mass production compatible, high-current contacts for integrated drive systems. Examination covers stamp & bend and welding techniques as well as specific springwire contacts (circular springs). The electrical properties of circular springs not only depend on design parameters (number of windings, tilt angle, wire diameter) but also on materials, contact force and surfaces. These parameters were optimized in terms of contact force, contact resistance and power loss. The contact elements were examined on a test bench for combined load environments according to DIN IEC 60068 / 60512 and ISO 16750. After testing the elastostatic and mechanodynamic behavior of the contact elements, they shall be implemented in two drive inverters of an integrated transmission and wheel hub system. The well-known technique of joining flexible cables is back in automotive engineering. Installation space in electric vehicles is limited so that standard cables are too thick. Very thin foil is an alternative to this end. 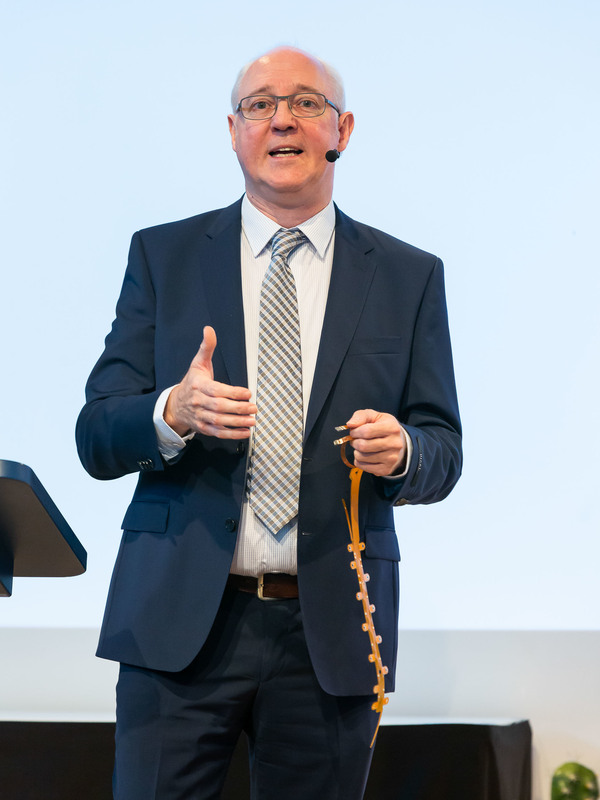 The presentation by Robert Wuyts (Föhrenbach Application Tooling) presents the properties and benefits of flexible cables and the related automotive applications. Flex foil can be soldered to a circuit board or glass plate. For contacting, the foil is inserted in a ZIF connector, or the contacts are crimped onto the circuit board. The quality of crimped foils is high because the foils can be precisely positioned. Image capture can determine the position accurately, and the crimp machine positions the contacts with high precision. The CpK value is better than 2. In contrast to conventional cabling, however, flex cables are less stable and have limited cross-sections. On the other hand, they require less space and simplify the integration of components. They are more expensive than conventional cables. Electrical connector systems are the interface between assemblies/modules of mechatronic or electrical systems. When selecting such a system, many users only rely on the electrical properties given on the datasheet without considering any potential subsequent environmental impact. This is a complex task that is difficult to master for SMBs. But even automotive manufacturers are concerned with unexpected consequences from connector system related issues. In 2013, for example, a product recall took place in the United States, because cables and power distributors had to be replaced due to unanticipated corrosion caused by vibration. 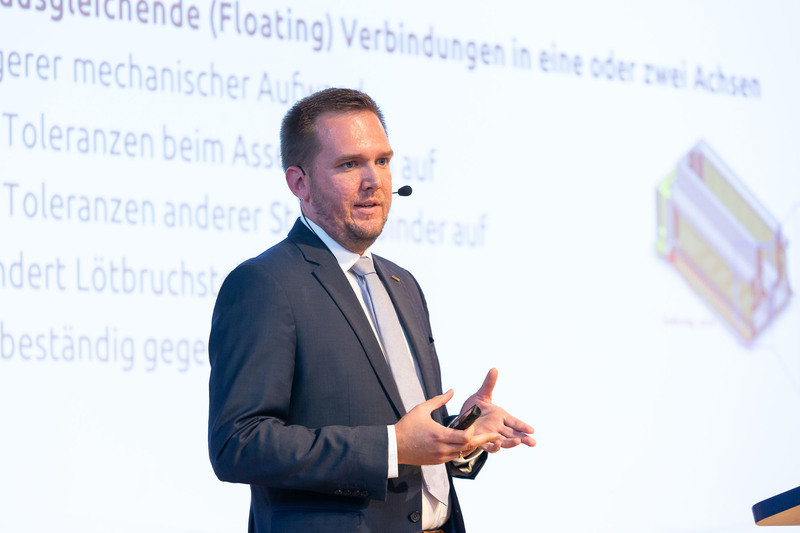 Dr. Ralf Hasler (Lacon Electronic) and Karl Ring (Fraunhofer EMFT) presented a joint project of Fraunhofer EMFT, the OWL university of applied sciences and the research association for drive engineering (Forschungsvereinigung Antriebstechnik). The research project analyzes the effects of micromotion on connectors and robust connector design. The aim is to develop guidelines for damage patterns, design/construction and the selection and test of connectors. The effects of micromotion on connectors depend on design features, casing, line properties and motion mechanisms. The project describes different failure models, creates a matrix between electrical behavior and surface changes and compares damage patterns from vibration, wear and friction oxidation testing. First results are expected in two years. Press-fitting is a standard process in the automotive industry. Lead-free tin plating is an explicit goal in the scope of EU ELV and RoHS regulations. The shift from tin-lead to lead-free tin has a particular effect on the press-fitting behavior and involves a higher risk of tin whiskers. 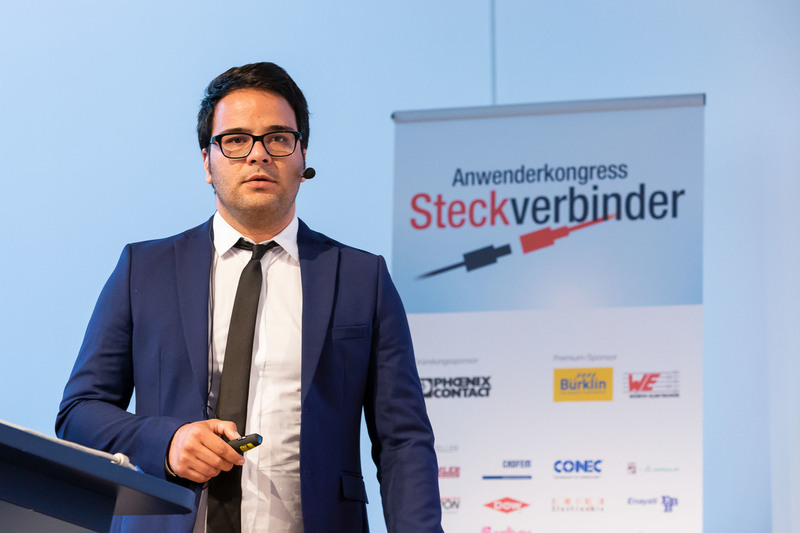 In his presentation, Dr. Amir Sadeghi (Doduco) discussed the prevention of whiskers in tin deposition by means of electrochemically passivated tin layers. A special test set-up was developed to evaluate whisker growth in tin layers as a function of deformation. After the whisker growth test, whisker density and size were determined by means of scanning electron microscopy (SEM). Further analysis covered the performance of passivated pins including mating/holding force and the transfer resistance between mated pins and circuit board. Surface passivation of tin layers lowers the risk of whisker formation significantly, with the oxidic top layer providing a strong physical barrier. Moreover, the ratio of SnO/SnO2 layers seems to have an effect on the inhibition of whiskers in the tin layer. The oxide layer does not obstruct the formation of the intermetallic phase. There is no impact on the electrical transfer resistance and the mating/holding force in commercial press-fit connectors. Safe, Green und Connected are the current megatrends in the automotive industry. For vehicle engineering, this means a growing number of higher pin-count control units in the car. Cable assemblers are challenged by higher complexity, limited installation space and higher mating forces. 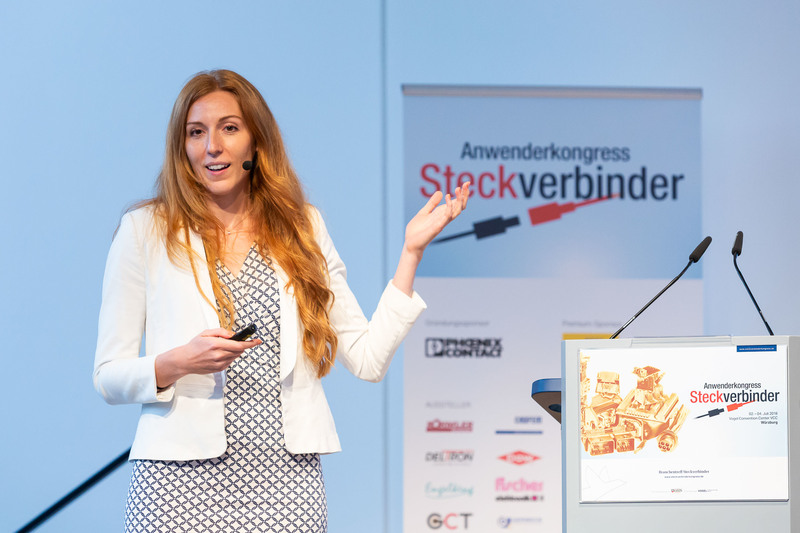 In her presentation, Dr. Svenja Kunz (TE Connectivity) explained that the Hertzian contact is a limiting factor when implementing high pin-count automotive connectors without higher mating force. An alternative approach is a spring-loaded socket contact with waveform contact geometry. To reduce the normal contact force, the length of the contact limbs was extended and the contact points were positioned in a staggered array. The wave-shaped contact design named LITEFORCE reduces the mating force by up to 52% compared to conventional “semicircular-on-plain” contact geometries. At the same time, the design significantly increases vibration strength, enhancing the current capacity by up to 26%. Thus, the contact exceeds the mechanical and electrical properties of Hertzian contacts. 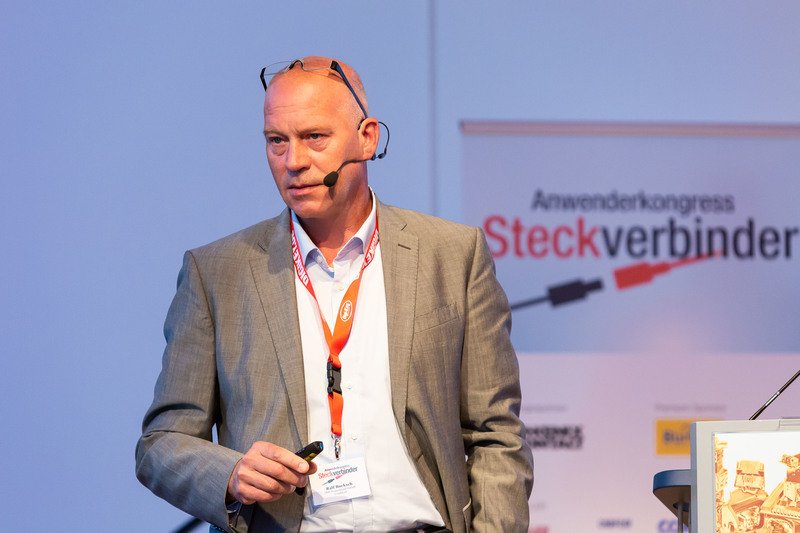 The last presentation, given by Stephan Ballhaus (Puretecs), had a familiar topic – protective coating. Protective coating was developed for emerging electronic systems as early as in the 1970s. The result were thin layers (500 nm) fully covering all surfaces. The material, long-chain fluoropolymers, is water-repellent and sufficiently tight to prevent contaminants from permeating sensitive surfaces. To achieve this, the component simply has to be immersed in a bath and dried for max. 5 minutes. This also works with contacts. The contact resistance increases by approx. 1 mΩ. Friction oxidation seems to go up as well. This will undergo further examination. All in all, fluoropolymer coating is a simple method of providing complete electronic assemblies with protective coating against contaminants at the site of operation. 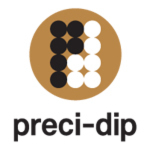 The method is applied across the entire electronics sector. Seminar 4: Surface Coating of Contact Materials (Thomas Frey, IMO). 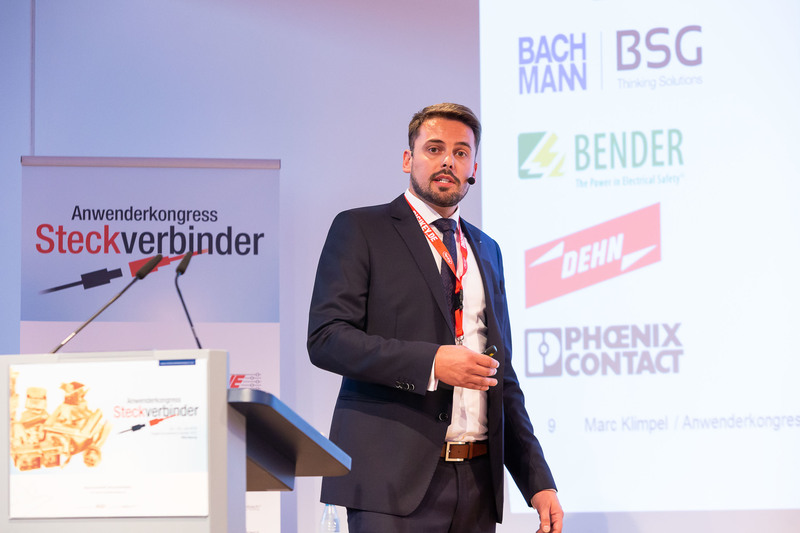 130 attendees took the chance to benefit from top-quality expert knowledge providing the perfect basis for the presentations on the two congress days. Apart from that, the knowledge will also help them master their everyday tasks. The hands-on workshops were also well received by the attendees. 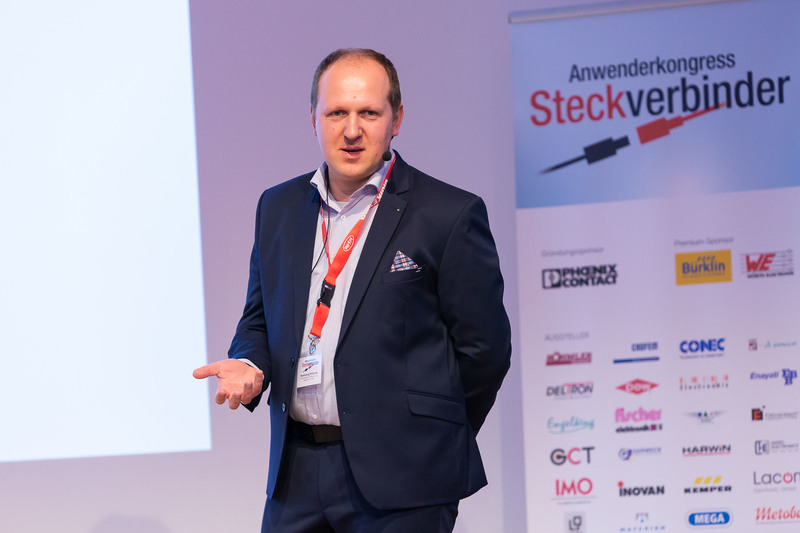 The workshop Fault Patterns in Connectors (Dr. Helmut Katzier, Ingenieurbüro Katzier) had most attendees, followed by the workshops on Industry 4.0 (Joachim Gräfer and Michael Schlue, Phoenix Contact), Press-fit Technology (Thomas Robok and Wladimir Werz, Würth Elektronik eiSos) and Overmolding (Andreas Wortmann, KSt-Institut Lüdenscheid). Further workshops covered Simulation with Encrypted 3D Components (Dr. Christian Römelsberger, CADFEM) as well as Leak Tests (Dr. Joachim Lapsien, CETA Testsysteme). 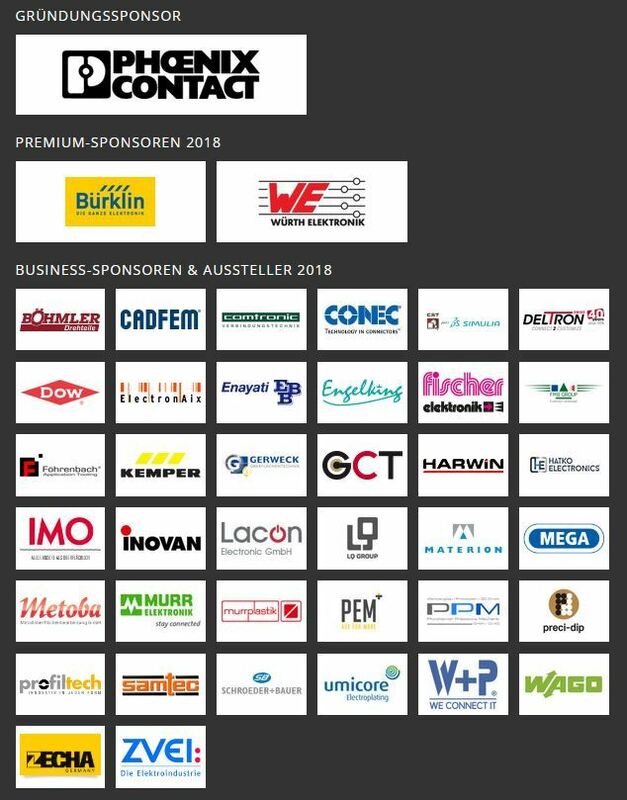 Attendees of the 12th Connectors User Congress 2018 can download the proceedings with their individual password. Papers not released for publication are not available. The presentation documents (slides released for publication by the presenters as well as the conference proceedings (unless out of print) can be ordered at a price of 150 EUR plus VAT: isabell.weisensee@vogel.de.